I read a wonderful novel over the Easter weekend. I was hooked by the end of the first page. A third of the way through I was racing though and I just couldn't put it down. By two thirds of the way through I'd slowed the pace right down because I didn't want it to end. It joins the genre that I've called the "gentle page turner" which has been defined elsewhere on this blog. A book that moves along slowly and yet is a page turner. A book that is quiet and gentle but not light weight by any stretch of the imagination. Full of peace, compassion, deep love, honour and loyalty portrayed through clean, beautiful writing. That is a gentle page turner. It's the genre which includes Gilead, Crossing to Safety and The Guernsey Literary and Potato Peel Pie Society. This latest discovery tells of life after World War One - what it was like for those who didn't go away to war and what it was like for those who returned from the fighting to try and resume normal life. It tells of the life of those brave men and women who were lighthouse keepers before it all became automated. It's the story of a returned service man, his new bride and their new life as the lighthouse keeper and wife on a tiny island just off the Australian mainland. And then there is the mystery of the row boat that comes to shore on the island with a dead man and a tiny baby, very much alive. 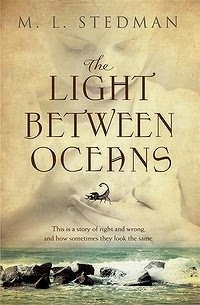 The Light Between Oceans is the debut novel for ML Stedman. It gets five stars from me. And I'd give it some more if there were more to give on the standard star rating. And lest you think I LOVE every book I read, after this (and I guess it was always going to be a hard act to follow) I started The Book Thief. I got about a hundred pages in and have put it aside. Despite the rave reviews that abound, this is not the book for me, at least at this time. And so I have gone back to the classics. North and South by Elizabeth Gaskell. I know every inch of the BBC mini-series. It's nice to be reading the words now. Speaking with a friend from school about church. I explain what our services look like and about how we have kids' activities at each service. Says friend, "How much does it cost for the kids' activities and do you have to book in for them?" Friend speaking with another friend about church with kids hanging about the adults listening in. Kid of friend who doesn't go to church chimes in with, "That sounds like fun. Can we go this Sunday?" Says her mum, "I don't think it is the sort of place where you can just rock up." I was amazed, surprised and somewhat in despair to hear these conversations. But when I think about it, the further we get from the 1950's when going to church was the norm (in Australia), the further we get from people actually knowing how church even works, let alone the content of our time spent together in church. I suppose I shouldn't be surprised. I was born in the late '60s (oh, that is beginning to feel somewhat old...) and even during the '70s and early '80s I was an anomaly amongst my peers spending my Sunday mornings in church. I've spent most of my life hanging about churches, but most people haven't. As I said, I was amazed, surprised and somewhat in despair to hear these conversations. But as I think about it a little more I see that it offers another way into salty conversation with our friends, asking people what they know about church and letting them know that they are most definitely welcome. There was a violent earthquake, for an angel of the Lord came down from heaven and, going to the tomb, rolled back the stone and sat on it. His appearance was like lightning, and his clothes were as white as snow. The guards were so afraid of him that they shook and became like dead men. The angel said to the women, "Do not be afraid, for I know that you are looking for Jesus, who was crucified. He is not here; he has risen, just as he said. Come see the place where he lay. Then go quickly and tell his disciples: 'He has risen from the dead and is going ahead of you into Galilee. There you will see him.' Now I have told you." And the big question for the kids...why were the guards so afraid? There are various topics that will comprehensively divide the Facebook community. I did it once when I asked, tongue in cheek, if people thought it was OK for one's four year to drink tea. (Leave no comments on this matter. Truly, I have heard them all.) And then there was the comment I put up at the beginning of January. 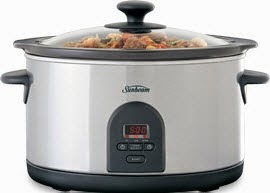 So, supposing I was going to suggest to my menfolk that they buy me a slow cooker for my birthday, any advice I should give them on brands, types, things to look for? Thus began two debates running simultaneously over the merits of slow cookers versus a good cast iron pot (with a few people weighing in with pressure cooker comments as well) and also whether or not a slow cooker was actually an acceptable birthday gift. Eventually a brave friend gave me this answer. And so armed with that advice, off they went and on THE day I unwrapped one of these. The irony of this post from Deb, appearing a week after my birthday was not lost on me. So the new slow cooker sat there for a while and eventually I was ready to give it a go. The first recipe? Jane's pulled pork. I sent a quick message to clarify what sort of BBQ sauce one would require. Do I just use Masterfoods BBQ sauce? I couldn't see a BBQ marinade in Coles today...but it may be that I have whole new section of the supermarket to explore. What do you suggest? I'm sure Masterfoods BBQ sauce would be fine, but I've only used a BBQ marinade from the sauces section of the supermarket. I totally think regular BBQ sauce would work - just make sure you use about 375mls of it. The pork will produce lots of liquid throughout the cooking process as all the fat renders off - just let it drip on a wire rack over the slow cooker for a good five minutes before pulling apart and serving. OK. I have everything I need to know so off I go to the shop to find the marinade. I walk up and down the relevant aisles and eventually I stop right in the middle of one and sigh a deep sigh. The accompanying son asks what's wrong and I tell him I am about to have to go home and write a really silly email to someone because I can't find a bottle of sauce in a supermarket and therefore I am going to expose myself as a complete goose. And as the word "goose" leaves my lips I see the marinade. Anyway, to cut short what is turning into an unnecessarily long story, a few days later (because I needed to recover from the stress of the shopping trip before venturing into new recipe and appliance territory) I made the pulled pork. And in my excitement with the ensuing aromas I invited people over for dinner. New recipe. New cooking method. Throwing caution to the wind. Outrageous. And it was lovely. If for this one dish only, I am sold. Since then I have tried a beef dish that came in the recipe section of the instruction manual. It was OK. A beef casserole of sorts. Too much thyme. Not really to our tastes. Then I did a version of beef stroganoff very close to Jane's recipe. I think Jane's addition of some tomato paste would seal the deal with this recipe. And I am looking forward to having a go at this lamb dish - the lamb rival for pulled pork I do believe. Somewhere along the line I worked out that the slow cooker is really just an electric casserole dish. You can use it on high and it will cook in the equivalent time it takes to do a casserole in the oven. And I am a convert to browning everything before placing ingredients in a casserole anyway, so this is no different. The benefit is to be found in the slow cooking function that turns tough, cheap meat into tender deliciousness over a much longer cooking time. So I am looking forward to trying out some of my tried and tested casserole dishes in the slow cooker and seeing how they go. 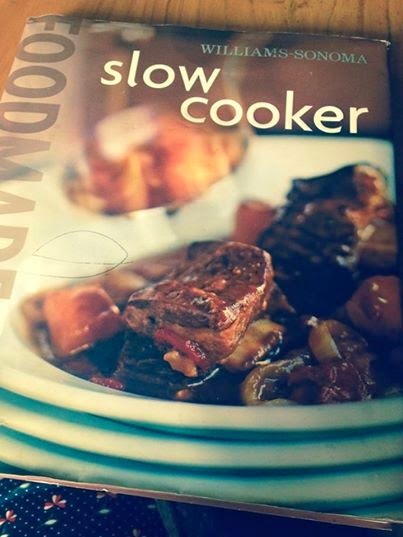 slow cooker recipe book to own. What I'm liking, which is new to my limited cooking skills, is the pulled pork/sticky lamb sort of genre. So here's the call out. If you have a great slow cooker recipe that isn't a casserole - I can do them - something really amazing and wonderful, can you please share it with me? You could email me or leave the recipe in the comments section below and as I try them out I will put them in their very own post. Complete with scores out of ten from my family if you like. You could opt out of that last bit if you prefer...they are pretty tough judges, this lot. Anyway, please, please, PLEASE tell me your "go to/it's not a casserole" slow cooker recipe. And as for gift suitability, this one worked for me. I like a practical gift although not so practical as to be a lawn mower, iron or vacuum cleaner. There's a fine line. They landed on the right side of the line with this one. Decided: after I posted the summer update right on the first day of summer that I would wait a bit with future seasonal updates until we were actually into said season. It does take a while for these seasons to kick in, after all. And can I say that it was great to have some rain over the weekend. I was very glad I'd cleaned the gutters earlier in the week. I've heard it reported that we received 19.6mm of rain in March, which happens to be the exact average rainfall for March. 19.6mm is also the total amount of rain that's fallen since 1st November 2013. So yes, the rain was welcome. And yes, the gutters did need a good clean before the rain fell. Celebrated: the change in weather by cooking this soup. The adults enjoyed it. It was probably a bit too much to introduce paprika, cumin and lentils to the boys all at the same time. Became: the manager of a basketball team on the weekend as well. (It was a big weekend.) So now I know exactly what constitutes a one pointer, a two pointer and a three pointer, I can find my way around a score sheet (you have to do a whole lot more than just keep a tally of the points it seems) and I can get those points transferred onto the electronic scoreboard. Piece of cake. Sort of. And then after that little triumph they tell me the whole system is going digital half way through the season with iPads and all sorts. Taking deep breaths. One step at a time. Reading: not a great deal at the moment. But I do have a bookmark in GPS: God's Salvation Plan by Allan Chapple, which I hope to get back to soon. I can't wait to tell you about this one. Keeping up: with my Bible reading plan and loving it. Every year is richer and better than the one before. Philippians Project: is going slowly. I am eleven verses in and that little amount is pretty shaky (although I do have a chunk of chapter two and a chunk of chapter four under my belt.) I have an appalling memory but I am not discouraged. When I do a bit of work on this it is pure joy and I'm not working to a deadline. Drinking: tea. Of course. You knew that. Eating: an apple slinky. Prepared for me by my son. The roles are reversing - he is cutting up my fruit now. Hilarious. 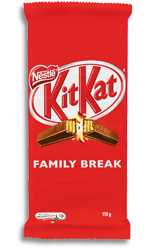 Pretty excited: while on the subject of food, to find one of these in the shops on the weekend. How good is that? A giant Kit Kat bar. There is one in my fridge. Yay. Consequently: my days really are quite packed now and by evening I am pretty tired. Blogging may or may not slow down for a while. I wouldn't want to make a definite call on this. I've done that in the past and then found myself posting twenty posts in twenty days. But if it goes quiet (or at least quieter) for a while I am OK, just busy by day and sleeping by night. Speaking of: the volunteering thing, I filled in a form (make that a veritable swag of forms) to enrol the child who is now able to make his mother an apple slinky into high school next year and on the line that requires me to list my profession what did I say? Home duties. Honestly, totally spineless. In the heat of the moment, I thought the "volunteer" thing was just too I don't know what for my opening foray into a new school. Maybe next time. Loving: this little acrostic that turned up on Facebook during the week. This could be very useful with the school holidays coming up. Signing off: with the words from Philippians currently spiraling around my head. Some words to encourage those of you who have so encouraged me here in the blogosphere. Thank you.